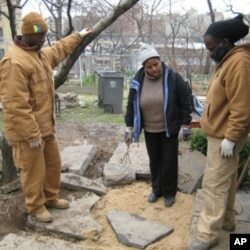 The 113th Street Play Garden is one of more than 500 community green spaces in New York City. Friday, April 22, is Earth Day, a time set aside to appreciate nature and to dedicate ourselves to protecting and sustaining it. New York City, a place many think of as an "urban jungle," is home to more than 500 community gardens where the crops are as diverse as New Yorkers themselves. Creating and sustaining these green spaces offer pleasure, camaraderie and much needed contact with the wonders of nature. It’s nearly nine a.m. on a workday but Noah Kaufman, volunteer manager of the 113th Street Play Garden, cannot help stopping at the 12-by-30-meter green space. Grabbing a hand trowel, he turns over the pebbly loam looking for worms for his plot. Organizer Catherine Wint helps train gardeners at the Roberto Clemente Community Garden in the South Bronx. "New York City is, if anything, the built environment. We have plenty of concrete. We have plenty of bricks. We have plenty of steel," says Kaufman. "We have little, little places like this vest pocket park, which are a small oasis, a piece of green, a place where there are trees, where there are weed trees, fruits trees which have been planted by humans or planted by nature provide a little refuge from the city. So for the neighbors here on 113th street, this is our front yard and we share it." The community garden has been a refuge for Alexandra Patz and her 7-year-old son ever since her family moved to New York from the suburbs where they had their own yard. "When we moved to the city, I was glad to find on this block that there was this little garden where we could become involved, and where my son could experience digging and growing things," says Patz. 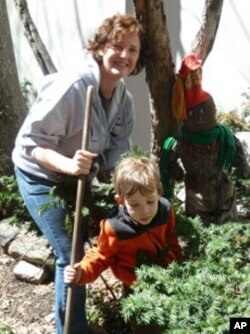 Noah Kaufman helps manage the 113th Street Community Play Garden. New York’s community garden movement began during the 1970s. It was a difficult era, when the city’s population was declining and many city-owned lots were trash-filled, rat-infested eyesores. Erica Packard is with the Manhattan and Bronx Land trusts, which raise money to buy urban green space and transfer ownership into community hands. The city offered to give the lots to organized groups in exchange for improving and maintaining them. "Those neighborhoods were, and still are, least served by the existing parks system," says Packard. "So they provide some of the only open accessible green space, particularly for seniors and children in low income neighborhoods." A milestone in the movement was the creation of Operation GreenThumb. It’s a program within the city’s Department of Parks that offers free gardening classes and light equipment like shovels and rakes. Still, in leaner times, many communities have had to fight to keep control of their gardens when the city wanted to auction the plots to tax-paying real estate developers. Some green spaces have been lost this way because people couldn’t maintain them properly. Community garden organizer Catherine Wint, of the Manhattan and Bronx Land trusts, says that because gardens are governed by grassroots volunteers with diverse interests, keeping them going is an exercise in democracy. Alexandra Patz gardens with her son, Douglas. "It’s different than a park because individuals in a community garden have to have a relationship and they have to work democratically," says Wint. "And they have to come up with procedures to enable them to share this very small space in a way that’s going to benefit everyone." The diversity of plants in the city’s community gardens reflects the variety of New Yorkers themselves. For example, there's a bed of special red peppers planted by a Mexican immigrant family growing next to a stand of flowering peonies tended by a homesick Chinese gardener. Mint says gardens in African-American neighborhoods often feature the collard greens and black-eyed peas favored on many Southern family farms. "And they hold up that tradition of farming because it’s still within the memory of the family. They still go back down South and their relatives still come up to New York. So it’s always a source of pride for them to bring their relatives to the community garden to see that they are continuing this tradition that’s gone on in their family for so long. And people walk by it and say ‘That’s a farm. That’s a farm.’"
There is pride on the face of Lori Harris as she surveys the half square block of green her farm-raised father, now 90, helped create from a rubble-strewn Harlem lot in 1979. "You have to give back to the Earth. You can’t just take everything from it. You gotta learn how to recycle and clean up. People think groceries come from the grocery store, but they come from a farm," says Harris. "They start from somewhere. So you really have to treat Mother Earth right and she treats you just the same."